We are all the sum of many different influences. So, it should come as no surprise that it creeps into our home décor as well. While purists do achieve some stunning outcomes, adding diverse touches can add a lot of personality to a space. The trick is to allow it to all come together nicely. Our last couple of blog posts talked about tweaking kitchens styles –both, modern and traditional – to create a unique look. This post continues the thread, looking at how fusion – not just of style but colour, texture and translucence can create great kitchen design. The kitchen does not have to be one solid colour. You can treat it just the way you would a living room – by choosing a colour board comprising 3-4 complementary and contrasting colours to create the effect you want. This is one of our handle-less kitchens. 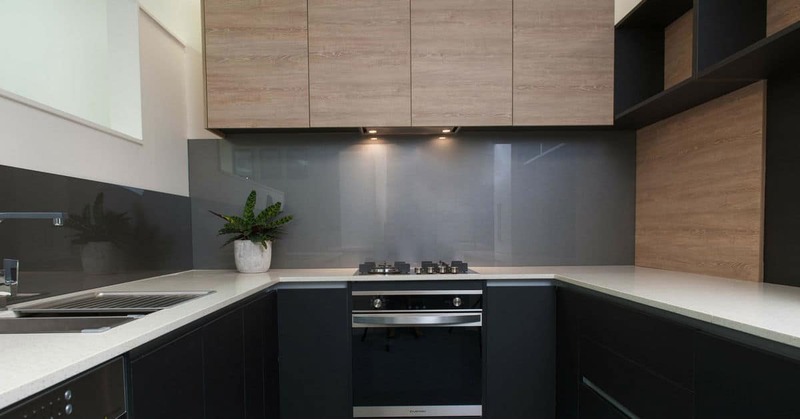 Very modern and dominated by the on-trend dark cabinetry, contrasted with the white benchtop. The overhead timber cabinetry adds warmth to the stark modernity of the black base drawers and simple slate splashback. Four colours but they come together brilliantly. We really like this one below done by US-based stylists, Pillar and Peacock. 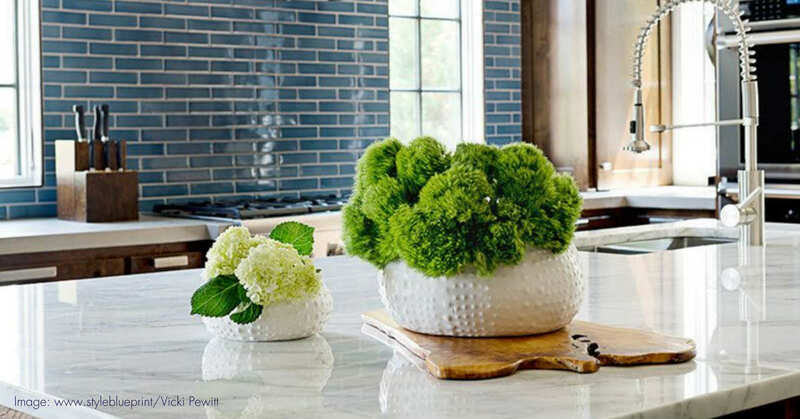 Blue subway tiles with a white marble benchtop. And while this kitchen has bespoke distressed timber cabinetry, a similar look can be achieved with a textured laminate and engineered stone benchtop. The cool blue and white cools down the heavy timber and provides a nice contrast. Again – 3 colours used to create a visual balance in the kitchen. The colour board also works in a very small space like the laundry. 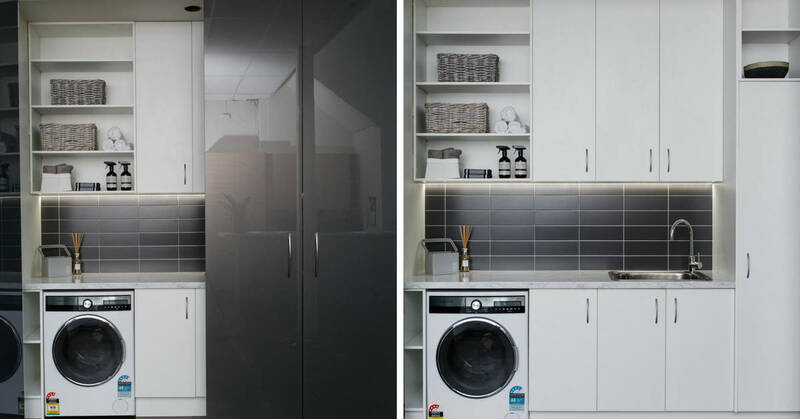 This is a grey and white concealed laundry. The high gloss on the grey cabinetry is not only modern but can reflect light, creating an illusion of space. In a smaller townhouse or apartment, this laundry can be tucked into a corner of the kitchen, a hallway or alcove. If you are looking at adding a bit of the exotic in a new modern kitchen, come down to our Richmond showroom and look at this display. Elaborate tiles, with a great amount of detail are the focal point of this stunning kitchen. Our customers often want a very modern kitchen. But they also want to make a bold statement. And these tiles are exactly that. It wows because the designer has played within the rules of the colour palette and so what you end up with is a contemporary kitchen with personality. Here’s another one of our kitchens (if you are a regular reader of our blog, you’ve probably seen this a few times), where the customer chose to create an aura of luxury with the island. 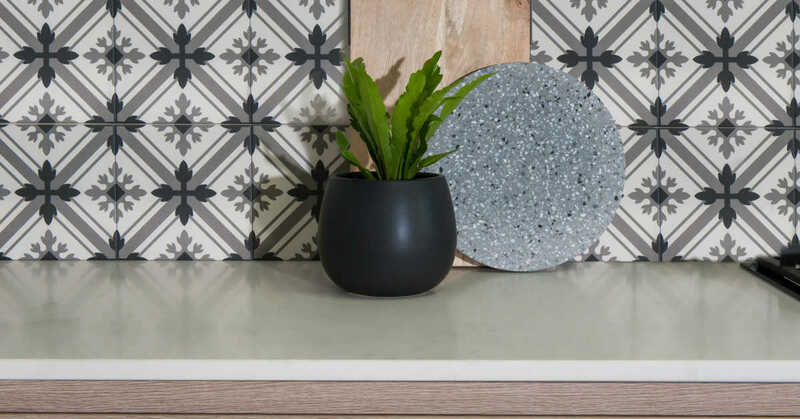 Now, concrete is associated with rough and rugged – more for an industrial-style kitchen. But this is a great example of how it translates into a high-end kitchen – a material has its own aura, but placed in the right context and scale, can perform very differently. Here the island fits in beautifully with the Zesta Kitchen – with the sleek handle-less cabinetry and modern accessories. Note the subtle colour board – 2 dominant colours – white and a few shades of grey. Not every kitchen is a grand design, but every kitchen we do, small or big is equally important to us. That’s why our designers work hard to get the look our customers want. Small tweaks can swing a look significantly. Here’s one. This is a Hampton style kitchen designed for a modern space. What gives it the modern look? 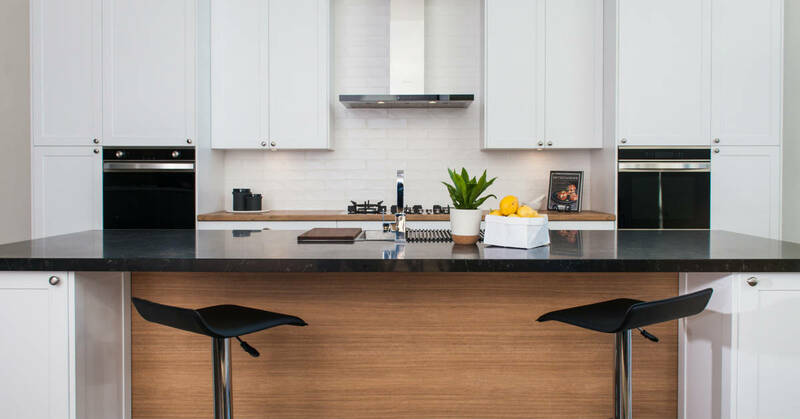 The granite island benchtop with contrasting timber base, swivel bar stools to match and the sleek tap and range hood. Here’s another one. Who would have thought of industrial lighting for a space emitting refined luxury? But these lights work brilliantly, picking up shades of colour from the tile trim, handles and the window dressing. 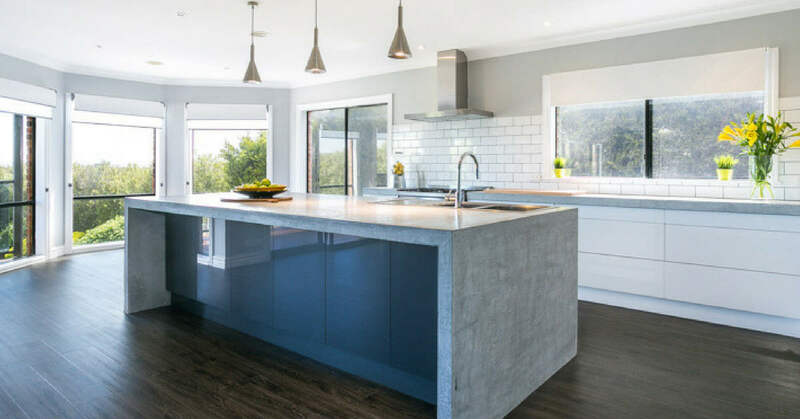 The benchtop is a cool and modern reconstituted stone. Along with the concealed hood and sleek appliances, they make the traditional cabinetry look very contemporary. 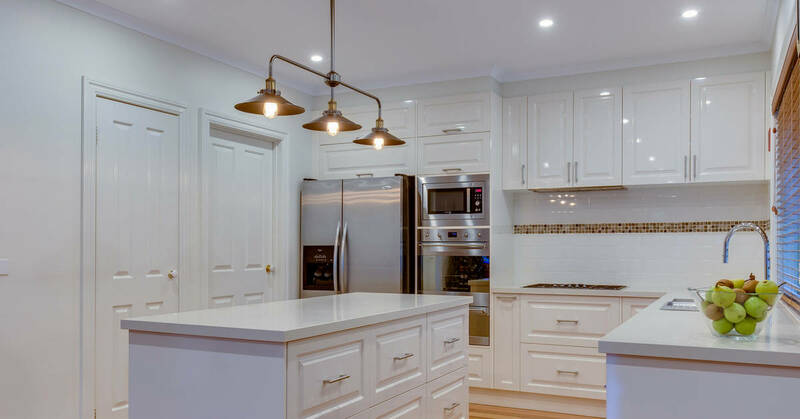 Zesta Kitchens has been in the industry for close to half a century and over the years, we’ve built thousands of kitchens and watched trends either endure or blaze out quickly. That’s why we believe that a kitchen must be as timeless as possible, yet stamped with the client’s personality. Be confident, break the rules, and make it about you.